The online version of this article (doi: 10.1186/1471-2148-13-118) contains supplementary material, which is available to authorized users. Flight performance is a result of complex interactions between body morphology (i.e., wings, tails), behavior and the biological and physical environment [1, 2, 3]. In addition, body size has an important aerodynamic effect on flight performance [4, 5]. One of the main reasons is that Reynolds numbers change many orders of magnitude from small to large flying animals . At small body sizes, viscous effects due to small perturbations in the air are dissipated more rapidly, while at larger body sizes those small perturbations can result in stronger unsteadiness of the flow fields around wings . Another aspect of morphology that has a large impact on flight performance is wing shape [6, 7, 8]. For instance, in insects, long and slender wings are optimal at long duration flight, while short and broad wings are optimal at slow and agile flight [6, 7]. Moreover, a broad wing base allows a wider speed range  and a narrow wing tip allows less costly extensive flight . Other body traits such as the centers of body and wing mass are also very important in predicting flight performance [10, 11]. It is important to note that wing shape has an allometric component  and also a non-allometric component, since wings are complex structures and a simple proportional change of its shape with body size is unlikely [13, 14, 15]. For example, similar size clines may be achieved by different changes in wing proportions . Therefore, wing shape and wing size may function as independent components of wing morphology ( and references therein), although wing shape would be expected to improve flight performance for a given individual size . Hence, comparative studies on how wing shape changes with body size should be important for a better understanding of flight performance. Apart from body size, other variables might also affect the optimal wing shape, for example flight behavior [2, 7, 18, 19, 20, 21]. We should expect a similar wing shape within certain flight behaviors, and at the same time variation of this shape related to body size. In a comparative analysis between size and wing shape it is therefore important to take behavior into account or using species with the same behavior. Another variable that potentially could affect wing shape is the presence of ornaments on the wings that are used for sexual displays. These ornaments are typically positively sexually selected, either by male-male interactions and/or by female choice, and are condition dependent [22, 23, 24, 25]. 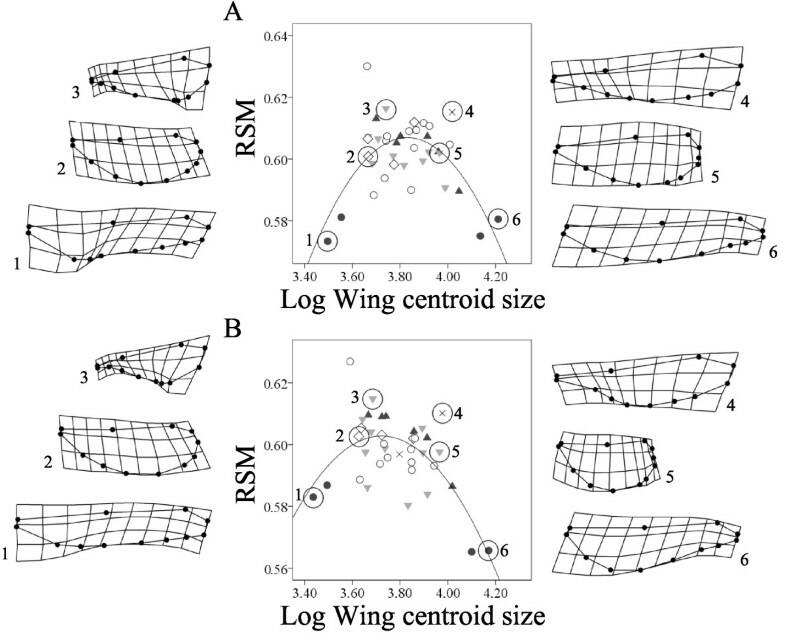 Wing shape may thus also play a role in ornament sexual signaling, since it might maximize both flight performance (e.g., flight style) and ornament display (e.g., size and shape of the ornament) [26, 27, 28]. For example, a large color patch at the tip of the wing should select for a broad wing tip shape  while a high agility (e.g., in territorial species) should select for a broad and short overall wing . Hence, the optimal shape might be somewhere in between these two. Therefore, the observed wing shape would differ from that predicted by aerodynamic theory per se. 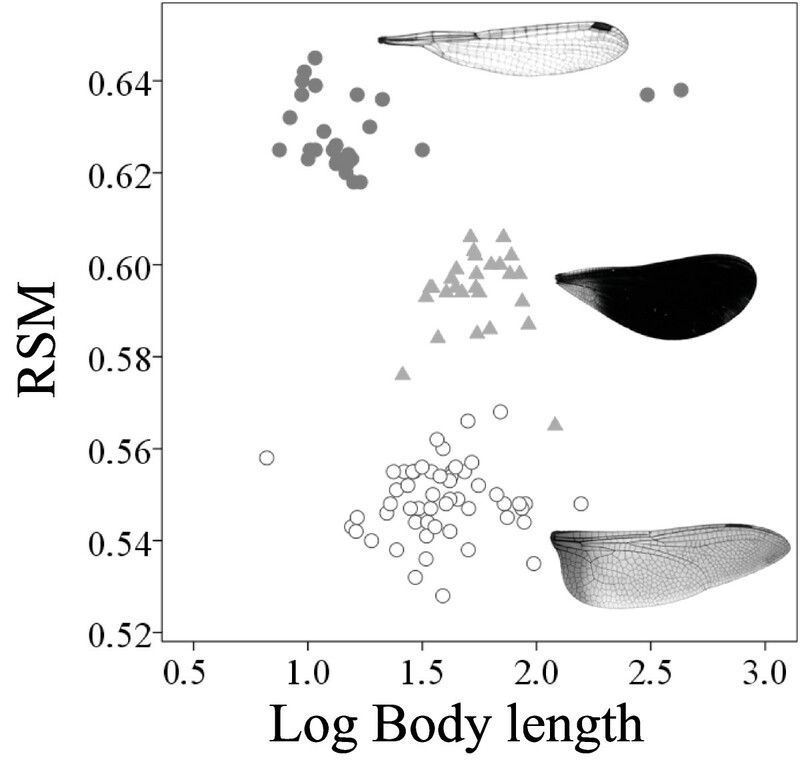 In this study, we explore how wing shape is related to wing size (used as a proxy of body size), and discuss its implications on flight performance. For that purpose we compare males of damselfly taxa within the family Calopterygidae. These species display territorial behavior . Territorial flight is a common flight behavior in insects such as butterflies and damselflies [30, 31] and is associated with broad and short wings, which are expected to improve flight agility [6, 10, 32]. 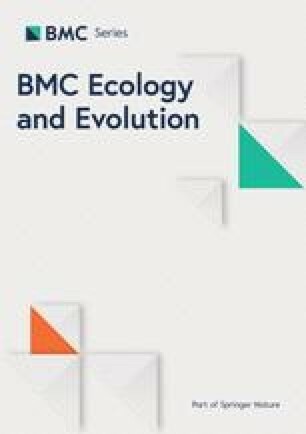 Many calopterygid males have wing coloration that is used for signaling in sexual selection processes [23, 33, 34, 35, 36, 37, 38, 39] and species discrimination [40, 41, 42], and it is also selected by bird predators [43, 44]. Although calopterygid males all have more or less short and broad wings, males still show a wide variation in wing morphology, which is related to wing size and coloration [28, 45, 46]. The present study differs from our previous works on wing shape in Calopterygidae [28, 45, 46] in that here we focus explicitly on the allometric effects on wing shape and the expected consequences on flight performance. The linear negative relationship between the RSM and size was a result from small species showing a higher distribution of the wing area towards the wing apex, whereas large species showed a concentration of the wing area towards the wing base. 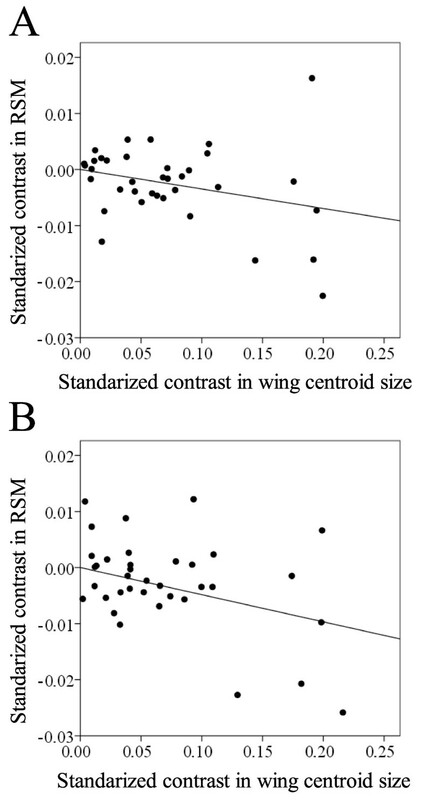 A tendency to a higher concentration of wing area towards the wing base in the large species not only promotes less-energetically demanding flight [10, 47], it also results in a higher range of available flight speeds [49, 50], which would be beneficial for avoiding predators and/or increasing prey captures [51, 52, 53]. The wing shape shown at smaller sizes is expected to be more energetically costly in terms of flight energetics. A possible explanation to this costly design might be the need to display during territorial behaviors. For instance, butterfly Batesian mimics were shown to pay important aerodynamic costs for flying slower and with more agility, as distasteful mimics do, improving color signaling to predators . where ĉ is the normalized wing chord and r ^ Open image in new window is the non-dimensional radius equal to r/R, where r is the distance to the wing base on the chord c and R is wing length (Figure 5). This parameter is proportional to the mean lift force and thus lower values involve less energetically demanding flight [10, 47]. We note that the first three non-dimensional radii of moments of wing area are highly correlated [6, 10]. The RSM has been used before in dragonflies and damselflies [32, 50, 57] and thus we decided to use this specific radius for comparative purposes. We also note that in Odonata, fore- and hindwings do not form a common functional surface as in butterflies [49, 57]. 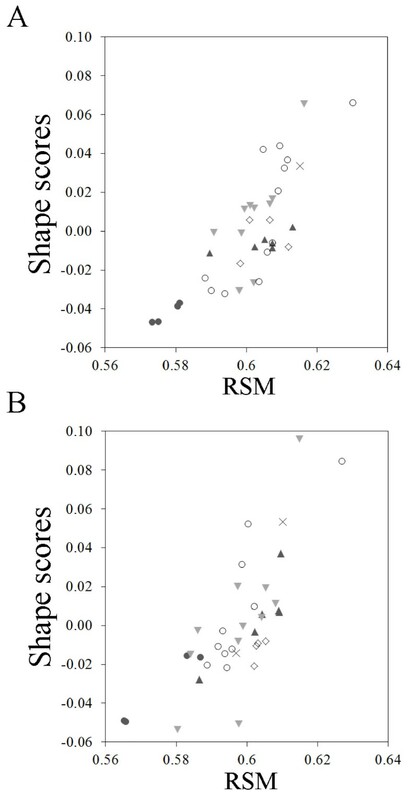 Therefore, we calculated the RSM separately for fore- and for hindwings by following the protocol of Serrano-Meneses et al. , using ImageJ  and Microsoft Excel version 14.0 (Microsoft corp. 2010). We are aware that both pairs of wings may aerodynamically interact with each other, however, the aim of this study is rather descriptive and comparative. 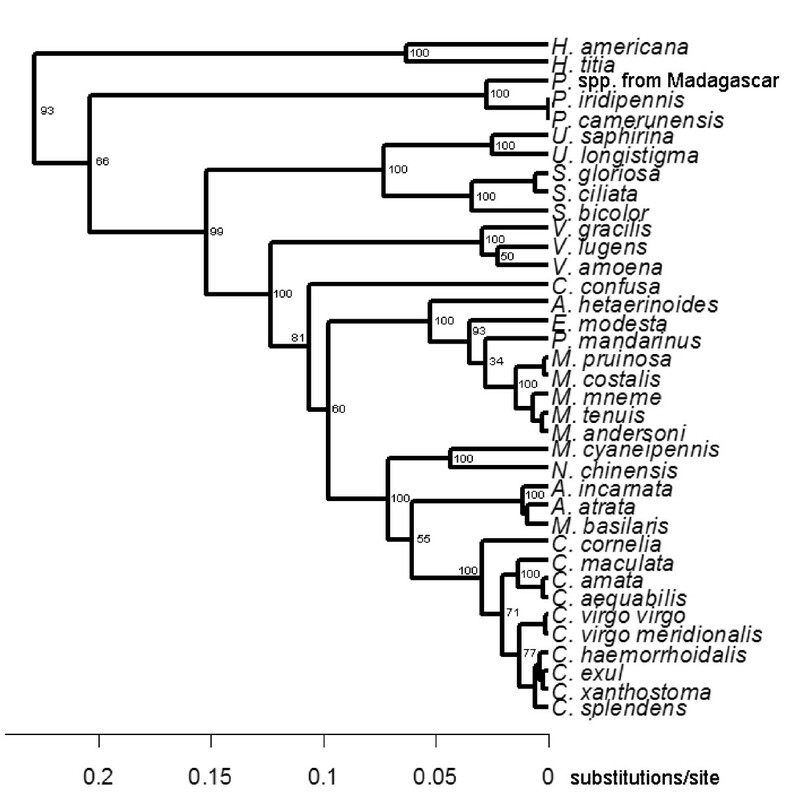 We used independent contrasts to correct for the phylogenetic non-independence of our study taxa. 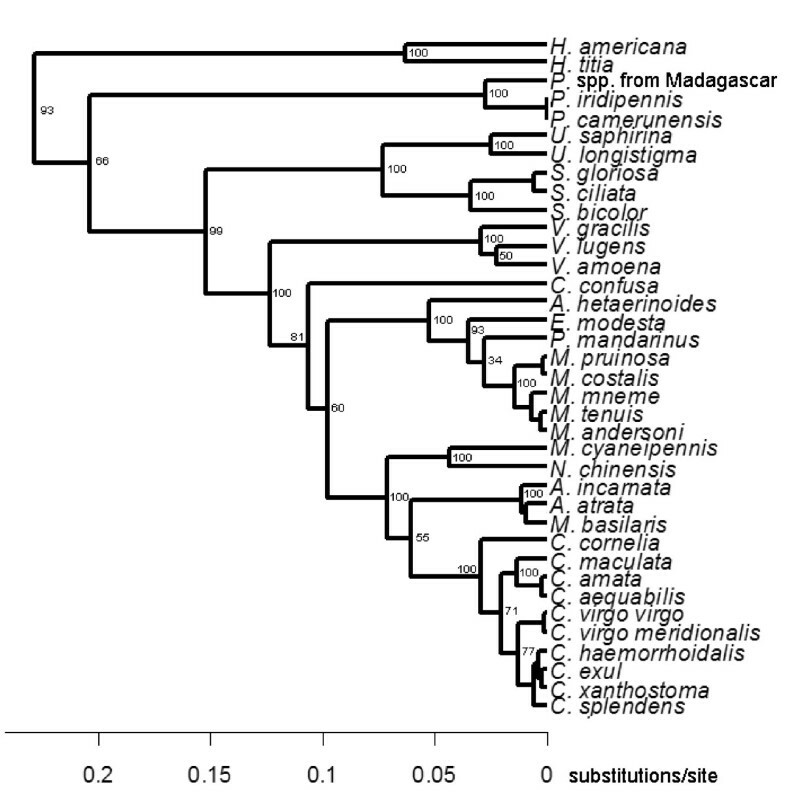 To obtain a phylogenetic tree that included all our study taxa, we re-analyzed previously published nucleotide sequences of the following genes: 18S, 5.8S, partial 28S rDNA, and of the spacers ITS1 and ITS2 [55, 66, 67, 68, 69]. We used 70 taxa of the family Calopterygidae and three more taxa as outgroups (two non-calopterygids damselflies and one dragonfly) (see Supplementary Table 1 in ). We aligned the sequences using the ClustalW algorithm  in MEGA version 5 . Aligned sequences were analyzed by a Bayesian phylogenetic approach in the package BEAST version 1.7.1 , using a SRD06 model as the nucleotide substitution model, a relaxed molecular clock (uncorrelated lognormal) and a birth-death process as a tree prior. The Markov chain Monte Carlo sampling was run for 107 generations and logged every 1,000 generations. The consensus tree was pruned and was then used for the independent contrasts (Figure 7). The tree obtained was similar to previously published trees .